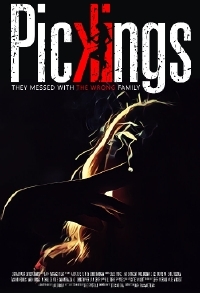 Neo-noir meets Spaghetti Western in Pickings, a film about a single mother and local bar owner who spent years trying to escape her past until mobsters came after her family. Written and directed by Usher Morgan, Pickings will be released nationwide via VOD iTunes on August 3rd from Dark Passage Films. PICKINGS, Morgan’s first feature, was filmed in and around New York City in 2016 on a budget of approximately $350,000.